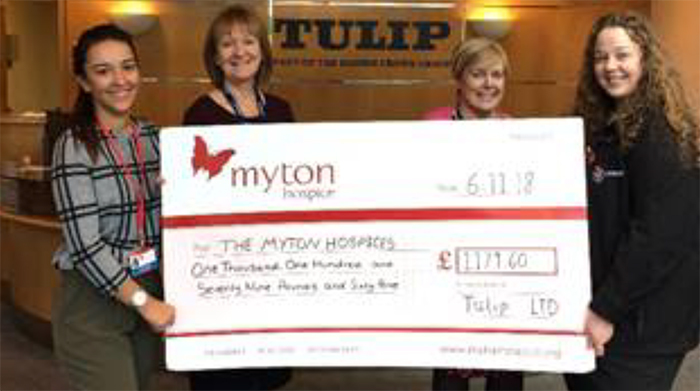 Tulip has presented local charity partner, The Myton Hospices, with £1,179.60 after a series of fundraising activities such as barbecues, cake sales, bonfire lunches, Christmas jumper days and raffles. The Myton Hospices provide compassionate end of life care, supporting over 1,400 patients across three sites in the Midlands. Tulip has announced its local charity partner for the next cycle will be Birmingham Children’s Hospital, following a vote by Tulip Warwick employees.